A scientific forum titled “Vietnam’s Economy 2016-2020: development breakthroughs” was held in Hanoi on September 4 by the Party Central Committee’s Economic Commission in coordination with the Vietnam Union of Scientific and Technological Associations (VUSTA) . 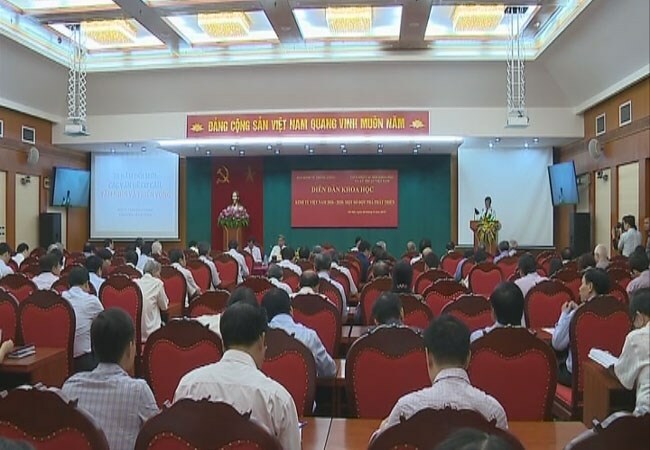 The forum aimed to make clear scientific grounds and the realities for the building of a social-economic development plan for 2016-2020 and contribute to the drafting of documents for the 12th National Party Congress. Although Vietnam has reaped important achievements in the past five years, the country failed to fulfil some of set goals, such as the uncertain stability of the macro-economy, the slower-than-expected economic growth and the slow-paced improvement in the economy’s quality and competitiveness. The building of institutions for the socialist-orientated market economy has not kept pace with the realities, and the quality of human resources and infrastructure are still an obstacle to development. Weaknesses in the fields of education, science and technology, culture, social affairs and environmental protection have been slow to be repaired while new threats to peace, stability and national sovereignty have surfaced. Based on the analysis of limitations and problems of the economy in past years, the forum focused on issues relating to institutions and the ways of thinking about economic development; economic restructuring; and reforms of growth models, productivity and total factor productivity.